Hiccups are annoying and very uncomfortable. They can even get you into trouble especially if you are eating or drinking something. 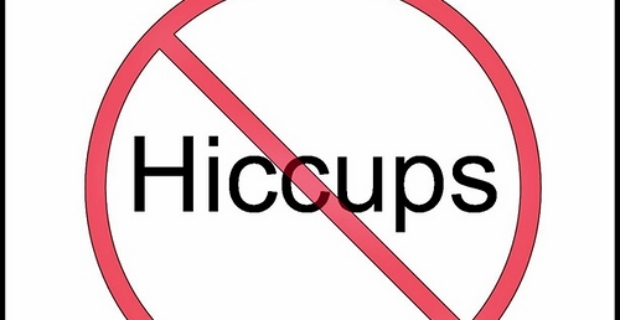 We show you what to do if you ever get those hiccups. Everyone gets them once in a while and whilst it is common amongst young children, even adults can get them as well. Hiccups are in effect air that is trapped in your abdomen. They are defined as involuntary contractions or jerks of the diaphragm. The frequency with which they are repeated varies from a few seconds to minutes. However, the rhythm between episodes of hiccups is relatively constant. In general, periodic or occasional bouts of hiccups are not of medical concern because they are resolved on their own. However, for most, hiccups are annoying and inconvenient. Many seek home remedies and those who have chronic conditions may be given medication. Believe it or not, hiccups may be triggered by several factors. If you are the type who eats very quickly, you might be prone to getting them. Fear, excitement, anxiety and euphoria can also trigger hiccups while drinking carbonated beverages, alcohol and spicy foods can provoke attacks. In other instances, laughing can also cause hiccups. Hiccups are easy to recognise consisting of a single or series of spasms. There may be shoulder, throat and body tremors. Most of all, hiccups are heard as chirps, squeaks or quick gasps. There may be brief pain in the throat, chest and abdomen and some interruptions in normal breathing. Hiccups go away by themselves and rarely are they signs of a medical problem. Several medical treatments exist. If hiccups are secondary effects of another medical problem such as gastroesophageal reflux disease, then the underlying disorder is treated first. Drugs are administered to people who experience intractable hiccups. Anti-psychotic drugs and sedatives may be given rendering the affected persons lethargic or unconscious. In other cases, drinking a carbonated beverage with salt can help in correcting a potassium-sodium imbalance. Other remedies include administration of intranasal vinegar to stimulate the dorsal walls. Another treatment discovered by Brian R. Payne of the LSU Health Sciences Center in New Orleans involves implanting a 'vagus nerve simulator' which sends waves of electricity to the brain via the neck. It is an FDA approved device to treat epileptic patients. Affected persons also resort to home remedies such as drinking a glass of water, holding the breath or pinching the nose. Breathing in and holding your breath for about 10 seconds also worked with patients as well as gargling with water and bringing knees close to the chest. Still, other sufferers claim that by not thinking about the problem, hiccups go away on their own. Hence, unless you suffer from chronic or intractable hiccups, they are just occasional annoyances that are pretty much harmless.